The sixth year of the Mt Pihanga/Rotopounamu project has passed in the blink of an eye, though perhaps it hasn’t seemed so to the worthy people who helped carry all those sacks of poison bait up the hill through the summer! This year we received welcome financial support from the Department of Conservation (DOC), Environment Waikato, Land Rover, the Pharazyn Trust and WWF. The project is a partnership between Project Tongariroy and Department of Conservation. 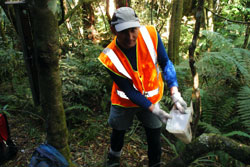 November 2007 saw a drop of 1080 over the Pihanga project area by the Animal Health Board. The rodent and mustelid populations were closely monitored as they fell to zero. Baiting using Diatrac to control rats began in early September 2008 following a tracking tunnel round in August that showed a rat relative abundance of 16%. Baiting took place over 350ha and 572 bait stations (Stage 1 area) and was checked for taken or spoiled bait and replaced every fortnight until all bait was completely removed at the end of February. The target of reducing rodents below 5% was not met and rat levels rose to 58% in December, a serious increase, though they dropped to 26% by February 2009. In the same period mice abundance leapt to around 70% and remained at that level for most of the season. This difficulty in controlling rat numbers this season is in line with similar projects in other parts of the country and may be the result of especially abundant natural food in the bush this year. As a test of how our efforts are affecting the native wildlife of the bush we monitor a number of species. Monitoring of birds continued with five-minute bird counts of all birds, and tomtit distance sampling. Five-minute bird counts appeared to show a decrease in the observation of a number of species, but both techniques produce reliable results only in the long-term. Results of monitoring populations of weta, bats, Dactylanthus and white mistletoe showed that these species appear to be stable. 50 DOC200 traps were run around the Rotopounamu footpath and caught a total of 97 rats, 28 stoats, a weasel and a mouse between October 2008 and February 2009. The effect of these traps on the pest population is small, but this season once again proved their use as a tool of advocacy in dealing with the general public visiting Rotopounamu. Work has continued on extending the area of bait stations to cover over 500ha, which will improve our effectiveness in reducing rat reinvasion to the core area as well as protecting a great area of forest. 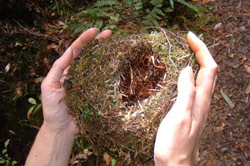 This winter is a beech mast and so rodent populations will gain a head start in repopulating the bush, but by hitting them hard at the start of the 2009/10 season over a greater area and then keeping the numbers low, we hope to prove that rats can be controlled sufficiently to allow native wildlife to prosper. Heather also took a significant knock this season when the Department of Conservation sprayed populations of this invasive weed on the summit of Mt Pihanga and around Lake Rotopounamu.